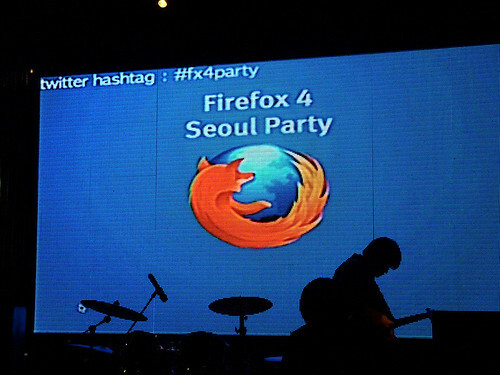 Firefox 4 Seoul Party was held at Club Mansion, Hongdae in Seoul on April 23th, 2011. 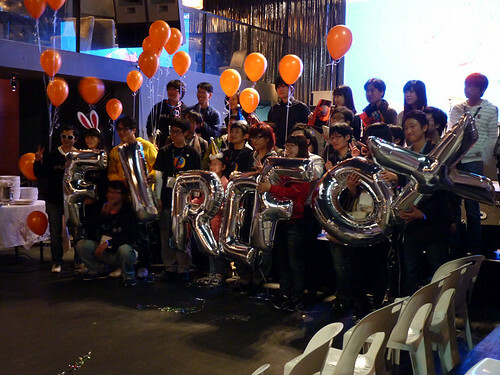 Over 120 Firefox fans enjoyed this event despite $10 entrance fee. 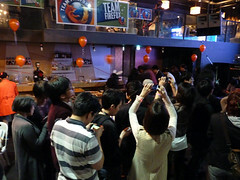 This event was fully organized by volunteers of Firefox 4 launching team and was great compared with Firefox 1, 2 and 3 launch party. 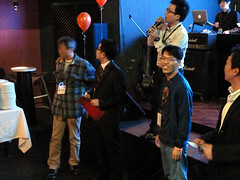 Especially Chris Jones, Andreas Gal of Mozilla Corporation and Eri Inoue of Mozilla Japan were joined us and celebrated Firefox 4 launching with Korean community. Attendees got many Firefox SWAGs including team firefox sticker, button, arm band from Mozilla and good firefox4 sticker, file holder from Mozilla Japan. 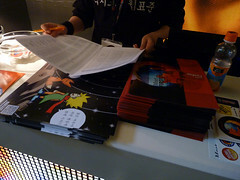 In addition, Daum.net – a strong sponsor for Mozilla – prepared mugcup and notebook and sponsored all budget of place rent and dinner. Thanks for all! 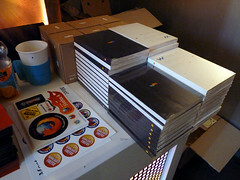 Before party time, we had developers meeting with Mozilla speakers for 2 hours. Over 50 people were joined and discussed with them for Firefox 5 features. Chris Jones spoke about Firefox’s Out-of-tab process and graphic accelerations and Andreas Gal did about JägerMonkey and research topics such as Rust, DOM.js and Servo. 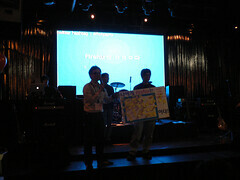 We started the party with ice-break questions to attendees. Four families accompanies with their kids and ten people have used Firefox from phoenix. One guy was single for 7 years and he got 4GB usb gift instead of girl friends! 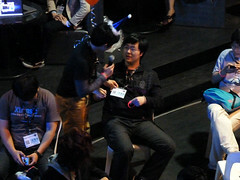 Quiz time was also enjoyed, but there were few people to give correct answers. 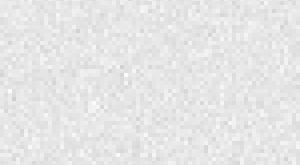 Please try it yourself. What’s name of the Firefox 4’s new feature grouping tab? When was the Firefox 1.0 released? How many languages supports Firefox 4? What’s a chapter and verse of Book of Mozilla in Firefox 4? What’s an animation movie appearing Red panda? Who is a philosopher used term of Persona? 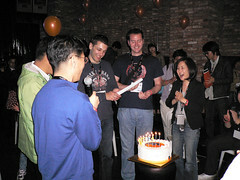 After the quiz time, we had cake-cutting ceremony to celebrate Firefox 4 launching with singing birth day song together. I thought this cake is the most beautiful in the world. 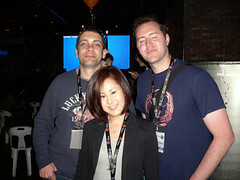 Finally I thank to Chris, Andreas and Eri for visiting Korea, Mozilla’s Gen Kanai, Mary Colvig and Korean volunteers for supporting event and all attendees. You can feel a pleasant atmosphere to watch as following warp-up video and see the activity of Korean launching team too. 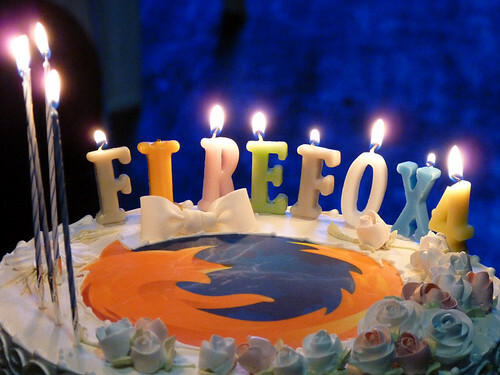 See you in Firefox 5 party soon! 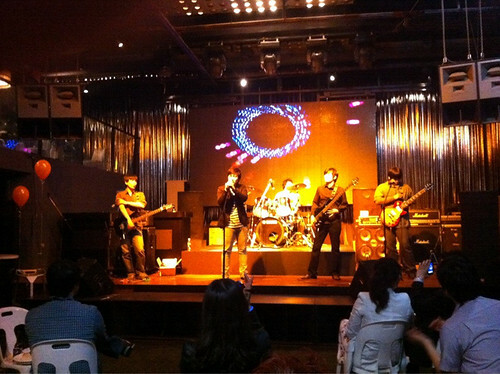 more photos in Channy’s Flickr, Eri’s Picasaweb and Korean blog Ggogun‘s developer meeting (1), (2), Jukofe.